Why Are These Knights Battling Snails? On August 28, 2015, I published the following post at Quirk Books. 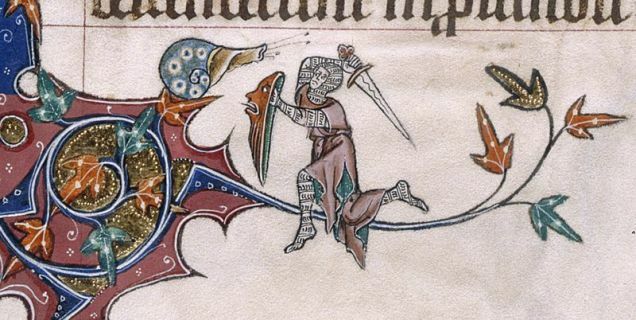 Quirky Books in History: Why Are These Knights Battling Snails? Medieval manuscripts are known for their beautiful illumination, aka the imaginative and colorful illustration inside letters or in the margin. But have you ever taken a closer look at what these illustrations actually depict? There can be some bizarre-looking stuff happening in these pages. This ain’t your typical Renaissance Fair fair. This entry was posted in History, Writing & Reading and tagged battle, illuminated manuscripts, knights, medieval history, Quirk Books, snails by Erika Harlitz-Kern. Bookmark the permalink.